Corti on the MV Agusta Reparto Corse – Yakhnich Motorsport Team F4-RR. And breathe…. 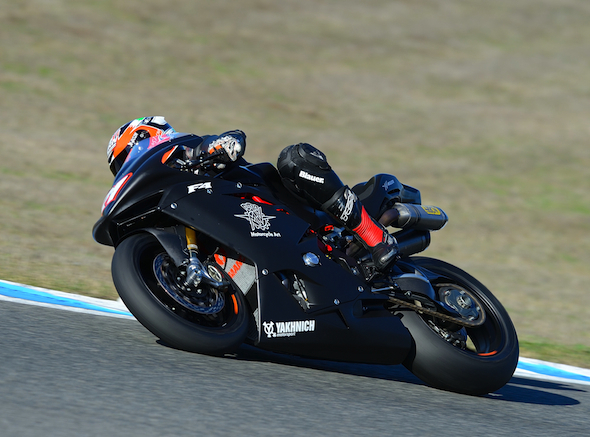 The official MV Agusta world superbike team, run by Yakhnich Motorsport, have been testing in Jerez over the past few days. MotoGP CRT exile Claudio Corti has been signed by the Italian/Russian squad for 2014 and got down to a 1.42.9 by the end of the test – compared to a 1.40.2 from world champ Tom Sykes. The MV Agusta F4-RR is still in development form, so expect more once the testing-ban lifts in January. Corti sounded pretty pleased. “I’ve never ridden a bike with a front end that gives such great feedback; moreover, the engine also feels extremely promising. I can’t wait to ride the completed, definitive version of the bike in the January tests, and I get the feeling we could get good results even in our very first year”.